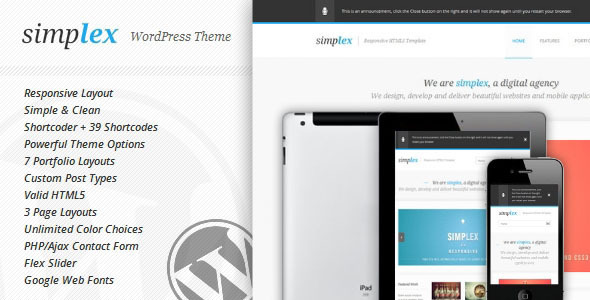 Simplex is a clean, simple and responsive HTML5 template suitable for digital agencies and studios. Simplex is using HTML5 and CSS3 with mobile devices in mind. Simplex will automatically adjust its size on various devices ensuring a pleasant experiment for all visitors. Fixed permalink color on the blog page, now they respond to changes in the skin color. Fixed the number of comments on a blog post if there are more than one comment. Fixed the category navigation for the filterable portfolio template on mobile layouts. Fixed the blog title bug on single posts. Fixed the blog pagination bug. Added a new option under ‘Theme Options -> Footer’ which allows selecting whether the social links should open in a new window or in the same window. Added XML file for the live preview content. Upon importing this XML file, go to Appearance -> Menus and select ‘Main Menu’ as your primary menu. Fixed a styling issue in the backend. Added an option to display Next/Previous buttons in the ColorBox preview for portfolio templates. Added an option to show/hide title/categories of portfolio items. Added an option to display titles of portfolio items as links or plain text. Added 3 new modules: [recent_blog_posts_module], [popular_blog_posts_module] and [random_blog_posts_module]. Available for use from the Shortcoder. Fixed map markers bug (Map markers weren’t showing).